At the Houston Public Library's Friends of the Library sale a few weeks ago, I found a decent first edition of The Quirt and the Spur: Vanishing Shadows of the Texas Frontier, by Edgar Rye (W.B. Conkey Company, Chicago, 1909). Despite a few library markings, I knew it was still a keeper with good resale value, but it was a double serving of bibliophemera inside the book that sweetened the deal and may also render any resale bittersweet. Opening the book revealed on the front endpapers an old bookplate from the Houston Public Library, acknowledging the donation of the book by H.H. Fletcher. I've come across a couple of the old library bookplates before, but it's always nice to have extras in my collection. 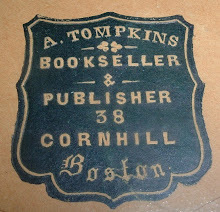 But on the facing page was the prize--a business card from the Anson Jones Press, from the owner no less, and the same H.H. Fletcher who donated the book. 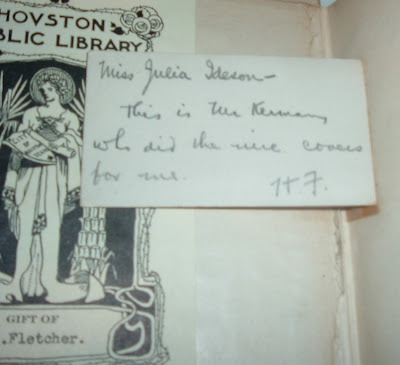 On the back of the card, which is creatively hinged onto the page, is a handwritten note from Fletcher to librarian Julia Ideson, the first librarian for Houston's first public library. He is apparently recommending a bookbinder, a Mr. Kerman, who had done work for him before. I'm not sure why the business card was affixed to the endpaper, but I'm glad it was. It started me on the research trail of this Texas bookseller/publisher. 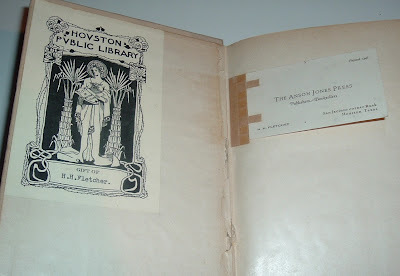 Collecting and selling books in Texas, I've run across old books published by the Anson Jones Press. 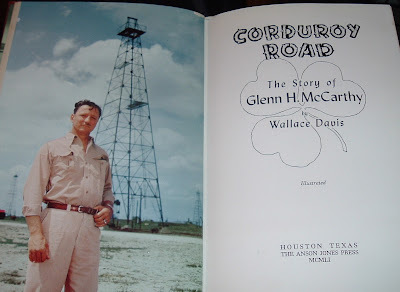 In fact, I also found and purchased at the recent library sale an Anson Jones Press title--a signed copy of Corduroy Road: The Story of Glenn H. McCarthy, by Wallace Davis (1951). More about this book in a future post, hopefully. McCarthy, a giant among Texas oilmen, was the inspiration for Edna Ferber's Giant. I didn't know anything about the Anson Jones Press before, other than it was named for one of the heroes at San Jacinto, the decisive battle for Texas independence, and the last president of the Republic of Texas. I never bothered to research the history of the company until now. 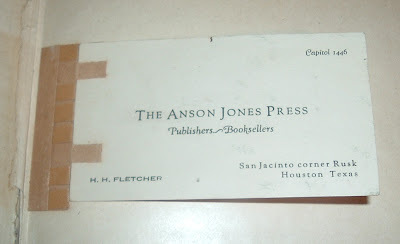 As a native Houstonian, I'm always interested in hometown history, so it was especially rewarding to learn that the Anson Jones Press got started in downtown Houston on, appropriately enough, San Jacinto at Rusk in Fletcher's Book Store. Herbert Herrick Fletcher and his new bride, Thelma Rawls Fletcher (interesting oral history here), moved to Houston from San Antonio in the 1920s and he went to work for Pillot's Bookstore. A year later, he hung out his own shingle and went into business as Fletcher's Book Store. About 1929, a Mrs. Williams came into the store with a story about a warehouse full of old Anson Jones books and wanted to know if Fletcher would be interested in purchasing them. Seems they'd been sitting in storage since the Civil War. 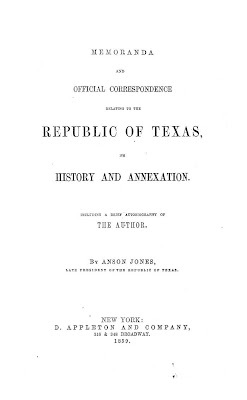 From the Special Collections and Rare Books Department at the University of Missouri Library, I learned that it was just one book: Memoranda and Official Correspondence Relating to the Republic of Texas Its History and Annexation Including a Brief Autobiography of The Author By Anson Jones Late President of the Republic of Texas (D. Appleton and Co., NY, 1859). One book, but 585 copies left over from the original printing in 1860. Jones' wife had refused them for some reason and there they sat until Fletcher accepted the offer and started a new publishing venture from the proceeds of the books' sales. He named his new publishing company after the source of its financing--the Anson Jones Press--and its emphasis would be on Texas history and authors. 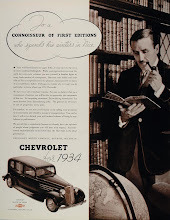 The Fletchers' grandson, Hugh Fletcher, has a site that lists all of the Anson Jones publications he is aware of and also provides a little history on the press as well. Anson Jones' book, by the way, can be viewed, page by page, at the Portal to Texas History, hosted by the University of North Texas Libraries. The Fletchers moved their bookstore and the Anson Jones Press to Salado, Texas in 1954, where they still thrive, run by descendants. As for Anson Jones, he only wrote that one book, whose ultimate legacy would be getting a press named after its author and getting more books about Texas published. Jones committed suicide in 1859 at the old Capital Hotel, later the historic Rice Hotel (now Rice Lofts), just several blocks away from where all those copies of his book wound up, giving rise to the press that bears his name. This ad cover for D.M. Dewey, Bookseller, in Rochester, New York was intriguing enough to research and see what kind of story might be lurking in the archives. The ad for colored fruit and flower plates hinted strongly that Mr. Dewey might have a more interesting history than the average bookseller & stationer of the day. 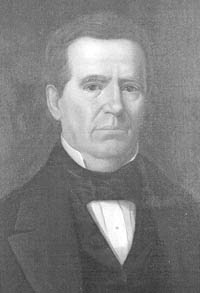 Dellon Marcus Dewey was a bookseller from the mid-1800s until the 1870s. During that time, Rochester, New York emerged as a leading center for the American nursery industry. The entrepreneurial Dewey tapped into that market's growth by publishing and selling color plates of fruits and flowering plants. These plates were invaluable sales aids for nurserymen and have become quite rare and collectible today. Dewey claimed to have been the first to provide nurserymen with fruit plates and later specimen books with the plates bound in. As early as 1859, a Dewey price list indicated 275 individual plates available for sale. He also began publishing plate books, such as the one shown below. Another example can be found in the William Reese Company's inventory for $400, as of this writing. But Arader Galleries in New York may have the rarest and priciest book of Dewey's plates, with an asking price of $18,000. By the late 1870s, Dewey had phased out his bookselling business, choosing to focus instead on the profitable chromo-lithographs of his publishing business. He employed some 30 artists and saw his inventory swell to between one-hundred and two-hundred thousand plates, which represented 2400 varieties of fruits, flowers, and shrubs. Dewey made the decision in 1888 to merge his business with the Rochester Lithographing and Printing Company. He reasoned that the talent each party brought to the table would create the best plates ever. Less than a year later, Dewey died. 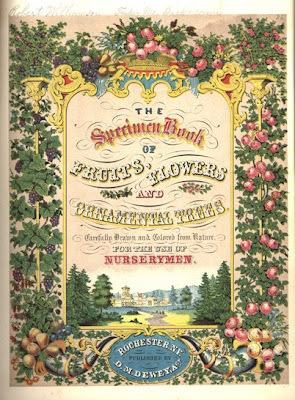 Karl Sanford Kabelac has written a very informative piece about Nineteenth-Century Rochester Fruit and Flower Plates for the University of Rochester Library Bulletin. Here's an ephemera item that, if you wait long enough, say 50-100 years, will have some collector value. Maybe not that long. What you won’t have to wait for, as the newsletter below indicates, is some good book hunting this weekend. And the newsletter is collectible at any time. Value, at present, is in the information it imparts. 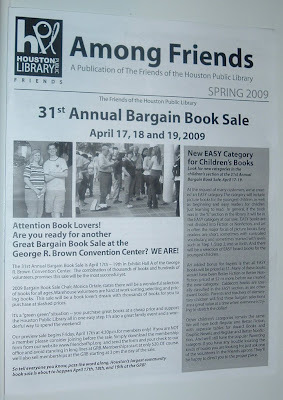 This is the Houston Public Library's publication Among Friends, and this issue announces the big sale taking place this weekend at the George R. Brown Convention Center downtown. As always, there will be some excellent value for bargain hunters. I’ll be there this afternoon for the members only preview sale. You can buy memberships at the door. The rest of the weekend is free admission. I will hunt for books from the time the doors open at 4:30 p.m. until they close at 9 p.m. And I still won't see everything. There are some 80,000 titles to peruse and select from. In the past, I've come away from the sale with Bobby Fischer chess books, Clive Cussler Icebergs, a rare 1920s print portfolio of Houston sketches by Texas artist Buck Schiwetz, a signed first of Lomax's classic American Ballads and Folk Songs, obscure and valuable local histories and genealogies, rare sporting books, poetry, literary criticism, and numerous bibliography and reference materials. Yesterday, I received in the mail the latest issue of Ephemera News (Volume 27, Number 3, Spring 2009). 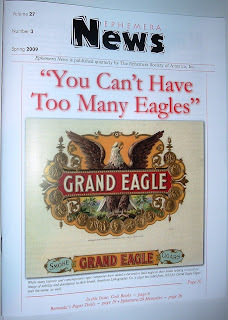 This is the quarterly publication of the Ephemera Society of America. In the Auction Preview & Review section, I saw a report on a bibliophemera item that exceeded price expectations at a recent auction. 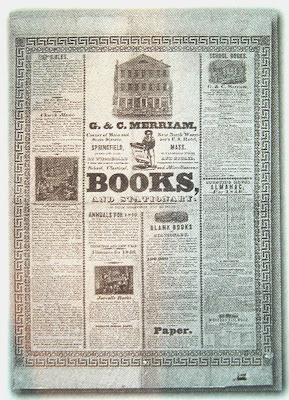 The ephemera item was an 1840 broadside for G&C Merriam Printers and Booksellers of Springfield, Massachusetts, offered by Scott J. Winslow Associates in Bedford, New Hampshire. This broadside advertises Merriam's stock of Bibles, church music, school books, almanacs, and blank books. Estimates for the broadside before auction were $1,250 and up. It actually sold for $2,185! 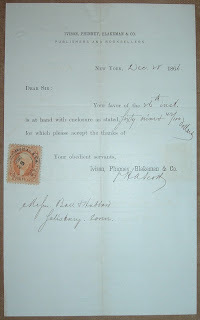 I recently posted here about a Lippincott bill of lading for a shipment of books to G&C Merriam. I mentioned the Merriam-Webster connection with this link to their history. The Ephemera News piece (Winslow I presume) mentions it also--Merriam's gaining the publishing and revision rights to the 1840 edition of Webster's Dictionary. But looking at the broadside's "BOOKS AND STATIONARY" (SIC) line in the center of the piece, Winslow quips of Merriam's Webster Dictionary acquisition, "Perhaps they could have used it for the broadside's headline that listed "books and stationary." Today, April 15th, is tax day here in the U.S., the day our Federal income taxes are officially due. If we haven't filed our tax returns yet, then today is the day we have to get our returns in the mail to Uncle Sam or file for an extension to deal with the headache later. The tie-in to tax revenue has everything to do with the date of these letters, more specifically the year--1866. On July 1, 1862, Congress passed the Revenue Act of 1862 to help finance the Civil War. From 1862 to 1883, tax revenue stamps were issued and required for various purchases, transactions, and documents. 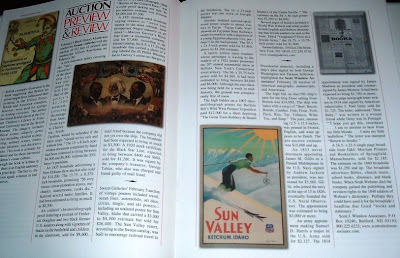 The American Philatelist, in their July 2002 issue, featured a well-written and informative article, by Gary Giroux, about the history and collectibility of these philately. I draw on that source for much of the information that follows. 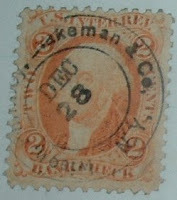 The article is also illustrated with examples of ephemera of the day and their required stamps. Among the most significant aspects of this legislation were the authorization of the first income tax and the establishment of the bureau that is today known as the Internal Revenue Service (IRS). The act also created Schedules A, B, and C to describe the various taxes to be collected on items such as inheritance, luxury items, documents, and retail goods. Documents fell under Schedule B and its 25 subcategories and required adhesive stamps to be applied directly to them. 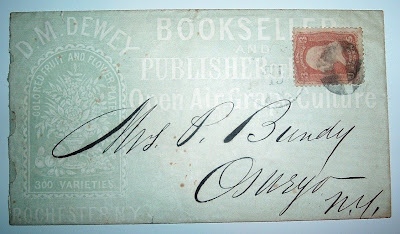 I assume my 1866 bookseller letters to clients qualified as Schedule B items and therefore required the revenue stamps you see affixed directly on the correspondence. 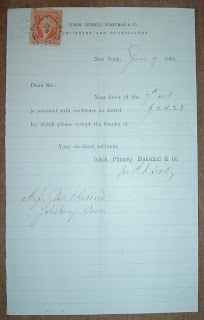 By 1872, the stamp requirement for documents was rescinded, except for the two-cent bank check. I have a promissory note, pictured below, for Caughey, McCreary & Moorhead, Booksellers and Stationers, of Erie, Pennsylvania, that may illustrate that type of document. The year is 1872, but it still has a tax stamp. 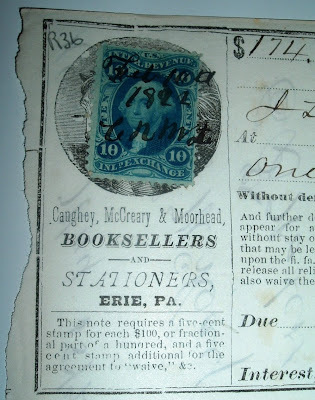 However, the stamp is a ten-cent stamp and the notation below the booksellers' company name informs us that five cents is required for each $100 or fractional part of $100. As this note is for $174, ten cents is required and obviously there was a stamp in a ten-cent denomination. 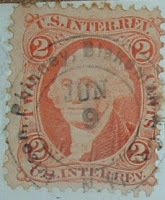 In 1883, all stamp taxes were eliminated, but the adhesive stamps did surface again during 1898 to help finance the Spanish American War and again during World War I. Shipping books in 1870 from one seaport city to another could literally require ships over rail to do the job. So a Philadelphia bookseller & publisher wishing to transport an order of books to Boston might opt to send them by water on a merchant ship. The conveyance of those books from shipper to recipient was documented with a now collectible piece of ephemera known as a bill of lading. The document I'm featuring here today illustrates the above example. 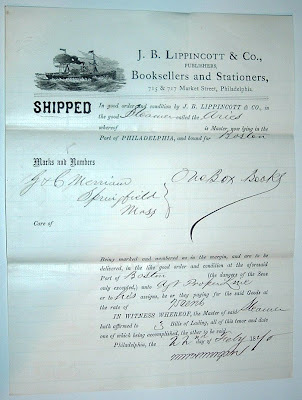 Here is a bill of lading for the Philadelphia bookseller & publisher, J.B. Lippincott, who was shipping a box of books to G.& C. Merriam of Springfield, Massachusetts (via Boston). Merriam was the same Merriam of Merriam-Webster Dictionary fame. As for the SS Aries, for any steamer enthusiasts, here is the story behind the former Civil War vessel. These documents usually depict the ship, as is the case here. For railroad bills of lading, the document usually uses a locomotive image. If transport was by river or canal, paddle wheelers or canal boats are often depicted. These are interesting pieces of Americana that offer insight into commerce and transportation during those eras in which they were created--the nineteenth century in the case of this Lippincott document. A few weeks ago, I headed east on I-10 out of Texas toward Florida for four days of baseball at various Spring Training camps. That was the main reason for the trip, but I created another agenda for myself, which would necessitate driving rather than flying: Book hunting through the Gulf Coast states. I was on the prowl for anything interesting that caught my eye and particularly for books about books. 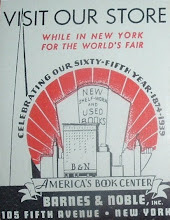 I had hoped to also find some interesting book trade ephemera--not bookseller labels and bookplates, though I found many interesting examples of that. I was more interested in stand-alone pieces that were not adhered to the book itself. Pretty slim pickings for that stuff in the old book shops I found along the way. But I finally did uncover a nice piece at Farley's Old & Rare Books in Pensacola, Florida. Dryden's Head Book Circular: A Descriptive Catalogue of Books, Comprising Recent Purchases, Including the LIBRARIES of Rev. E.A. SANDFORD, Denford; Rev. T. ADAMS, Daventry; On Sale by TAYLOR & SON, Northampton. This is advertised as a New Series, No. XV, 1887. Under the title of Dryden's Head Book Circular is more information, divided by what has to be an image of English literary icon John Dryden's head. There's a good bit of information packed into the masthead of this catalogue cover. 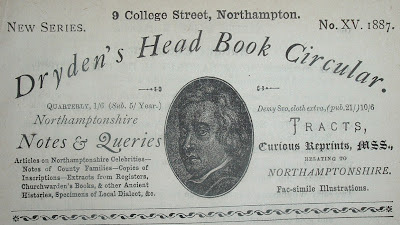 To the left of Dryden's head, it appears that the bookseller is offering local histories for the Northampton area. 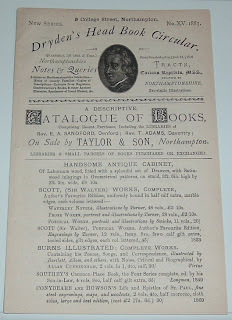 To the right of Dryden, there is more Northampton material advertised in the form of Tracts, Curious Reprints, Mss., and Facsimile Illustrations. 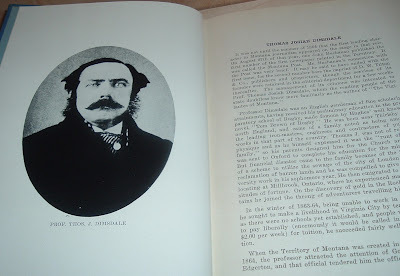 Some research on the Taylor & Son firm reveals that John Taylor was also a writer and wrote a number of histories about the Northampton area. Some, if not all, were published by his Dryden Press. That would explain the ads on the front cover. So what of Taylor's homage to Dryden? 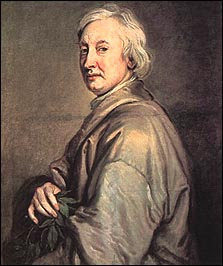 Dryden's legacy loomed large in the area, the celebrated poet having been born and raised close by in Aldwincle near Oundle in Northamptonshire. 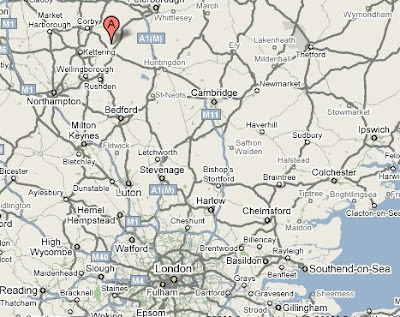 Aldwincle indicated by "A," Northampton is to southwest. I don't quite understand the Dryden's Head part of the catalogue title. It appears to have something to do with a place or a building from the area's history. Perhaps it is more of a mascot for Taylor & Son. Frits Knuf Antiquarian Books, in Vendome, France, has in their stock, as of this writing, a book published in 1732 titled Books Printed, and Sold by William Warner, at Dryden's Head, next to the Rose Tavern, without Temple-Bar, London, by William Warner. From that, it sounds to me like Dryden's Head was a location with a physical address, but that's about all I can find out about it. Maybe a reader out there can shed some light on this. I have found other examples of famous authors in England's literary history whose Heads have been lent to the name of a place. I'm curious about the story behind this naming convention. Anyone? In researching all the clues offered in this piece, I tried the street address (9 College Street) and matched up right away with a book shop, but I was surprised that the book shop was Odyssey Books in South Hadley, Massachusetts, whom I 'm familiar with, having been a subscriber to their First Editions club. What an intriguing biblio-coincidence! Same street address as their English bookselling brethren from the 1800s. The catalogue itself begins rather curiously with a listing for an antique cabinet, followed by antiquarian books for sale. The next page veers back to antiques with a listing of "Antique China, Etc." Books resume on the next page and the catalogue ends with "Illustrated Papers, Etc." and "Drawings and Engravings." The Reverends E.A. Sandford of Denford and T. Adams of Daventry, whose libraries help comprise this catalogue, seem to have faded away into obscurity and have slipped under google's radar. Nary a word on them. 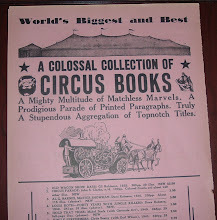 But their books made it into a Northampton bookseller's catalogue more than 120 years ago. And that catalogue has traveled across the Atlantic to at least Florida and Texas and, now, wherever the Internet may take it around the world. 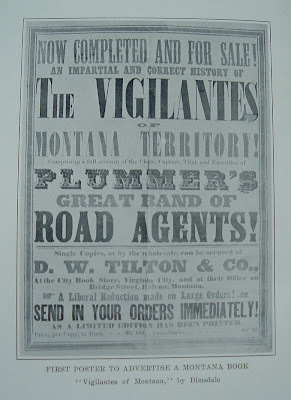 Here's a reprint of the first piece of ephemera to advertise what is quite possibly the first book published in Montana. 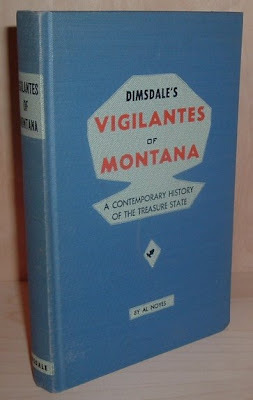 I acquired a book recently (pictured below), compiled by Al Noyes, that focuses on Thomas J. Dimsdale's 1865 book about the vigilantes in the Montana Territory who stamped out rampant crime that had terrorized the region for two years in the territory's infancy. I had intended to crosspost this entry, with a lot more detail about the book's subject matter, on Archaeolibris, but I found a wonderful blog by anthropologist Kathleen A Dahl, in which she has already written about this book and its author, so I'll defer to her excellent post on the book's content. Pick and Shovel is the title of her blog and within its pages she explores (though not lately) how the Old West has been portrayed and interpreted by the public and in the media. She has even included Dimsdale as a character in a serialized historical novel of her own. Seems like a clever nod toward Dimsdale, who initially serialized his vigilante account in a Montana newspaper. In 2006, Ms. Dahl wrote this about Dimsdale and his book.